JOHNSON, W.C. (Bill) Command Sgt. Major, Ret., age 84, passed away July 13, 2013. He was born to William F. and Felcia Johnson, June 28, 1929 in Sikeston, MO. He was preceded in death by his parents, a brother William Johnson, a sister Lillie Klein, and three daughters: Patricia Anne Johnson, Karen Lynne Levi, and Kathleen Shakespeare. He is survived by his wife of 62 years Vernetta Johnson. They were married December 2, 1950 in Hopkinsville, Ky. He is also survived by his son David W. Johnson (Ralle’t), seven grandchildren: Christopher Levi, Julianne Levi, Matthew and Daniel Shakespeare, Joshua, Samantha, and Megan Johnson, three great grandchildren: Jaydon and Jack Greene, and Tyler Shakespeare. Bill joined the Army in 1946, part of the time served in the 11th Airborne. 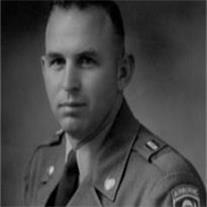 After his retirement from the Army in 1969, he worked for the City of Tempe as Customer Service Supervisor until 1990. Funeral services will be Monday, July 22, 2013 at 10 AM, preceded by a visitation at 9 AM at the LDS Del Rio Ward, 1871 E. Del Rio Dr, Tempe, AZ. Arrangements by Bunker’s Garden Chapel.